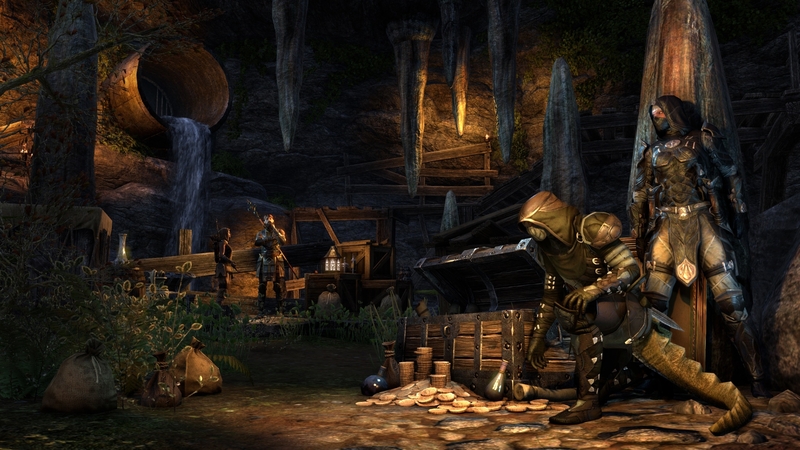 The Thieves Guild expansion for the Elder Scrolls Online came out last Monday for PC. As an ESO Plus subscriber, I immediately had access to it. So here are some impressions, a week in! There will be minor spoilers throughout, though I don’t think I’m far enough in to reveal any big spoilers. So far? I really like the new Thieves Guild questline. It helps that the first quest is super-fun and that the first questgiver (Quen, an Altmer novice thief) is likeable. Most importantly, it introduces the gameplay elements that characterize this DLC. They really disadvantaged the “kill everything that stands in your way” playstyle, and I appreciate it. There’s lots of sneaking, as well as guards with lanterns who can sniff you out of stealth (which has been used elsewhere in the game, but sparingly). To this they’ve added hiding spots where you can stay safe for a few minutes. I also like the use of choke points — and water full of slaughterfish to keep you from swimming across said choke points. There are also distraction mechanics, puzzles, and even a few — ugh — jumping puzzles. And yes, even parts where you can just kill stuff, too. The basic plot behind the new content is that a fanatic group, the Iron Wheel, is cracking down on the Thieves Guild after a failed heist pissed off certain Taneth nobles. You meet Quen, the aforementioned novice thief, in your local Outlaw’s Den, where she’s looking for a partner for a heist. From there, she brings you into the Thieves Guild and you learn about their struggles to bounce back from recent misfortunes. I already mentioned my love for Quen. I like how her naive idealism is paired with her stone-cold badassery. She’s definitely not cut from the same cloth as many Altmer; I didn’t enough know she was one until she started talking about her family. I like everyone else in the Thieves Guild so far, too! I like Walks-Softly, the Argonian who shows up to save you from a failed heist (“oh, look, a crypt. Nothing bad ever happened in a crypt”). I like Zeira, the Redguard guildmaster, unsure of her new role. I like Nord banker/bookie Kari (“I. Never. Miscount”), and her twin sister and disguise artist Hola (“have you ever seen us in the same place at the same?” “Uh, she’s sitting right over there”). I like grumpy Velsa. In addition to the main quest, Kari offers quests from a tip board, usually of the type “go to this zone and pickpocket certain types of stuff” (that’s another new thing: oodles of new items to steal, and items are categorized into classes — Personal Effects, Cosmetics, Dry Goods, etc). I was a little worried they would turn out to be as tedious and annoying as the repeating “go to a city and steal X” quests you have to do in the Skyrim Thieves Guild, but blessedly, they are not. There’s a mechanic whereby you can turn the quest in after the first step for a small reward, or go on to further steps for a greater reward, which is kind of neat. If you’re more into the shivving things and getting out with the treasure, Spencer Rye’s “acquisition” missions will send you to delves and world bosses around Hew’s Bane to collect various items. (Warning: the world bosses are in the style of the Orsinium DLC, i.e. you’ll need a group to defeat them). One thing worth noting: much of this content will be really challenging for non-thief characters. Br’ihnassi, my thief, has invested a fair number of points in Legerdemain, and is a nightblade, to boot, with all the extra sneaky-sneaky abilities that confers. She still gets caught a fair bit. In Abah’s Landing, it seems like every pickpocketing mark is a Hard mark, and even with two points in the Light Fingers skill, that’s still only a 60% chance of success at best. Thankfully, the DLC adds a lot of stuff to mitigate the dangers of getting caught stealing. There’s the Clemency skill in the new Thieves Guild skill line, which allows you to weasel out of being cornered by a guard once per day. Even before you unlock that, there’s a skill to make Bounty and Heat decay faster. Plus, doing quests from Kari’s tip board will get you one-use items that erase Bounty and Heat. I haven’t said anything about the new zone of Hew’s Bane, have I? For one thing, it’s small — maybe half or a third the size of Wrothgar. Like the Orsinium DLC, the content scales to your level — which is why I’m doing it with my V8 nightblade instead of my main. Most of the zone is taken up by the sprawling coastal city of Abah’s Landing, home of the titular Thieves Guild. In general, the architecture and landscape of Hew’s Bane hearkens back to zones like Alik’r and Craglorn — which makes sense, it being in Hammerfell and all. When I first arrived in Abah’s Landing, I found myself in a picturesque seaport, bigger and more atmospheric than others I’ve seen in the game. This initial impression really formed my opinion of the city as a beautiful and complex place. With more exploration, I discovered lots of winding passages with cubbies to hide in, perfect for thievery. Abah’s Landing also takes advantage of all three dimensions, with a lot of stuff happening above street level, where the buildings are connected by boards and platforms. A large chunk of the city, the Warehouse District, is off limits, and you can only get in by secret passages, jumping puzzles, or by just plain sneaking. I also favor the BRIGHT BLUE DOME of the building that shelters the Thieves’ Guild, which is easily spotted when you are desperately trying to get there with your ill-gotten gains. Another thing this DLC adds — more relevant to non-thieves among you –is thieves’ troves. These are caches found throughout the world, full of stolen goods, lockpicks, set items, etc. Anyone can open them, although the contents may require laundering at your local Outlaw’s Den in order to use. It was in fact one of these troves that led me to the Mournhold Outlaw’s Den where I met Quen. That pretty much covers the new stuff… but lots of changes were made to existing content and gameplay, some big, and some small. Cross-faction grouping for dungeons and trials. No more playing everyone’s least favorite mini-game, Abusing the LFG Tool. It was kind of uncanny to be able to just… invite guildies from AD and DC to do pledges with us. The UESP guild took advantage of this on the first weekend it was available to run two of the Craglorn trials, Hel Ra Citadel and Aetherian Archive. We actually managed to get through fast enough to get the timed trial achievement on both — admittedly, not that big a deal when all the enemies are V12 and you’ve got twelve V16s. (Sadly, the gear that drops is all still V12, too). Templar changes. The big one is that Breath of Life now hits two targets instead of three. This caused quite the kerfuffle when it was announced, with many templar players believing they’d been nerfed out of healer competition. But I’ve run several dungeons since the DLC came out, and I haven’t noticed it making a big difference. If three out of four members of your party need a big, fast heal at once, something’s very wrong — possibly so wrong that hitting a second BoL a second later won’t help. Supposedly they also fixed the bug whereby using Toppling Charge would lock you out of your abilities. I’m not holding my breath. (It’s also not a core part of my build). Champion point changes. They changed how several Champion point trees worked. Notably for me, the Magic damage increase was taken out of Thaumaturge in the Ritual tree, and put under Elemental Expert in the Apprentice tree. Thaumaturge now only affects DoTs (which I use relatively few of). I don’t know if it’s due to this change — I ended up moving a bunch of points from Thaumaturge into Elemental Expert as a result — or due to Templar changes in general, my gear improving (I’m now rocking two gold Torug’s Pact swords on my DPS bar), or FTC just being crazy, but I am pulling some serious DPS as a result. I used to struggle just to hit 10k; now I’m regularly hitting 20-22k. This while healing, mind. New pets. You get the echalette pet for having the Orsinium DLC installed, and a jackal pet after completing the first Thieves Guild quest. The echalette is cute in the way only a baby spider-bison could be, but OMG THE SOUNDS IT MAKES ARE AWFUL. Especially when you have ten of them chilling in the bank. There is still no chub loon pet, though, which is clearly an oversight on ZOS’ part. 64-bit client. There’s a 64-bit client available as of this last update. It’s not hooked up to the launcher, so you have to go digging for it, but it exists. It’s still very beta, and seems to have memory leaks like whoa. And then there are the places where they just forgot the textures. This has led to some really uncanny bugs, like shirtless vendors. Lest you think this is awesome, consider that underneath their clothing, most NPCs are featured like Barbie dolls. This was pretty hilarious, though. Either way, the 64-bit client is mostly a curiosity at this point. Change to DirectX11. As of this patch, you can only play the game with video cards that support DirectX11. I’m not sure why it requires this, and Matt and I are unaffected, but it means there are some guildies we won’t be seeing until they get a new graphics card. I’m not sure if this change is to blame, but I’ve seen a decent amount of glitchiness since TG came out — crashing to desktop, low FPS in certain places, etc. (Although a big FPS drop Matt was seeing turned out to be the result of the uespLog addon, which Reorx/Daveh quickly fixed). Stealth changes to veteran Imperial City Prison. Vet ICP is notoriously hard, mostly due to its second boss, Ibomez the Flesh Sculptor. Previous to this week, I’d only been there on normal mode, but I know about the mechanic whereby you throw bombs at the zombies and atronachs to keep them from enraging. (My guild refers to the bombs as watermelons, because they’re green and why the hell not). I also knew that most groups had better luck ignoring that and just DPSing him down. Well, I finally went to vet ICP this week. Our group make-up was suboptimal (three DKs! ), and I expected to be stopped cold at the Flesh Sculptor. I was surprised to get him on the second try. Later, checking the official forums I learned they’ve apparently lowered Ibomez’s health, made him invulnerable when he’s standing by the pool waving his arms, and capped the number of waves of zombies. This basically means you can’t just ignore the mechanic and DPS him, but it also means it’s possible to get past him with less than excellent DPS. I’m okay with that change — anything to make the game less about gear and more about skill. (I’m less okay with the necrotic hoarvors and their poison spit, or how much pain Lord Warden Dusk inflicted on us before we finally gave up, but I blame that entirely on our sub-optimal party/DPS). Those are the major points from me. All in all: Thieves Guild good! Get it if Elder Scrolls and fantasy larceny is your thang.